Use the keyboard to quickly place orders within the Market Window using Hotkeys. Hotkeys can be customized from the Hot Keys tab within Properties. The mouse or the spin buttons may be used to adjust the quantity or price. However, you may also use the keyboard to manually enter a quantity or price. Click to select a Market Grid price or quantity cell. Press F2 to send a Buy order. Press F11 to submit a Sell order. Note: You may also press the * (asterisk) to multiple the existing order quantity by 100. Use the keyboard to enter a value. Note: Enable and configure the hotkeys in the HotKeys tab on the Properties menu. Most users will use the keyboard or the spin buttons to enter order quantity and price. However, you may also use the mouse to increase or decrease order quantity. Click to select a Market Grid cell to populate the Order Entry pane. Right-click to increase the numeric value. Left-click to decrease the numeric value. If you prefer, you can trade with the keyboard enabling hotkeys. Hotkeys for joining, hitting, and taking current bid and ask prices can be enabled and configured in the Hotkeys tab on the Properties menu. For a list of the default hotkeys, refer to Keyboard Trading in the Order Pane. In the Component section, click to select Order Pane. In the Keyboard Layout field, click to select Custom. In the Component section, click Order Pane. In the Command section, click the command for which you would like to change the hotkey. Press the key or keys you want to represent that command. If the hotkey is already assigned to a different command, you are prompted. You can use the keyboard to make trades in the Order Pane. 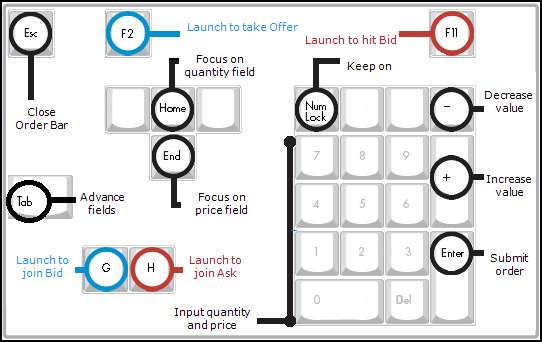 Enabling keyboard trading provides an alternative for entering orders and does not disable the mouse. For procedures on enabling and changing hotkeys, refer to Entering Orders Using the Keyboard. The function hotkeys consist of the Esc and F keys at the top of your keyboard. They also include the Home and End keys. Seeds with the best Ask price for the highlighted contract and sets the Order Pane as a Buy when Broker Mode is enabled. Seeds with the best Bid price for the highlighted contract and sets the Order Pane as a Buy when Broker Mode is enabled. Seeds the selected contract in the Wholesale Order window. Places keyboard focus on the highlighted quantity field. Places keyboard focus on the highlighted price field. Seeds with the best Ask price for the highlighted contract and sets the Order Pane as a Sell when Broker Mode is enabled. Seeds with the best Bid price for the highlighted contract and sets the Order Pane as a Sell when Broker Mode is enabled. Note: When the Order Pane is used as the Floating Order Entry (FOE) style, it launches a new Order Pane with the focus on the Quantity. It either seeds with zero or if you set a default quantity, it seeds with the lesser of the default quantity or your maximum order quantity. The main hotkeys are in the centralized body of your keyboard. Places keyboard focus in the highlighted Account field. 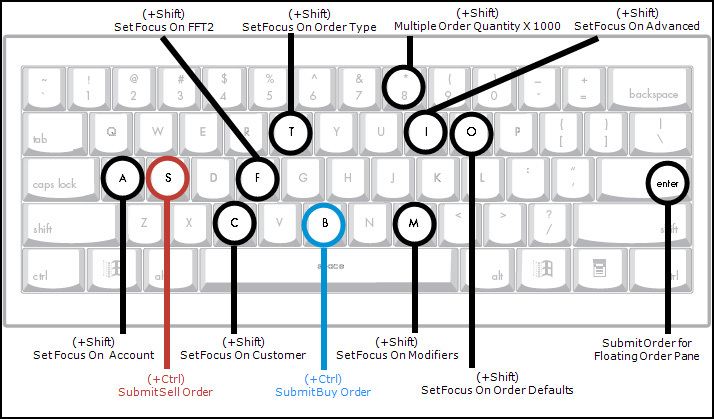 Places keyboard focus in the highlighted Customer field. Places keyboard focus in the highlighted FFT2 field. Places keyboard focus in the highlighted Order Type drop-down list. Submits a Sell order. Pressing this key has the same effect as clicking the Sell button. If the Order Pane is configured as a Buy ticket, this hotkey switches the form to a Sell ticket but does not submit the order. Submits a Buy order. Pressing this key has the same effect as clicking the Buy button. If the Order Pane is configured as a Sell ticket, this hotkey switches the form to a Buy ticket but does not submit the order. Places keyboard focus in the highlighted Advanced drop-down list. Places keyboard focus in the highlighted Order Template drop-down list. Places keyboard focus in the highlighted Modifieres drop-down list. Multiples the order quantity in the Order Pane by 1000. Example: If the quantity is currently 5, upon pressing * the quantity increases to 5000. Submits the configured order from a floating Order Pane. Pressing this key has same effect as click on the larger Buy or Sell button. Note: Only applies when in FOE mode and Broker Mode is set. You can use the keyboard to interact easily with the Order Bar. Use the default hotkeys or customize them to create your own. Launch Order Bar as a Buy seeded with and focused on the Bid price. Launch Order Bar as a Buy seeded with and focused on the Ask price. Lets you edit the quantity field. Lets you edit the price field. Advance the cursor to the next field for editing. Submit the order as defined and close the Order Bar. Close the Order Bar window. Lets you use the keypad to type numbers. Decreases the numeric value of the field you are editing. Increases the numeric value of the field you are editing. Launch the Order Bar as a Sell seeded with and focused on the Ask price. Launch Order Bar as a Sell seeded with and focused on the Bid price. Call the Buy Order Bar or Sell Order Bar using your specified keys. Input the quantity and price. Press TAB to advance fields, SHIFT+TAB to go back a field. Press ENTER to submit the order. In the Component column, click Order Bar. In the Command column, click the command for which you want to assign a hotkey.